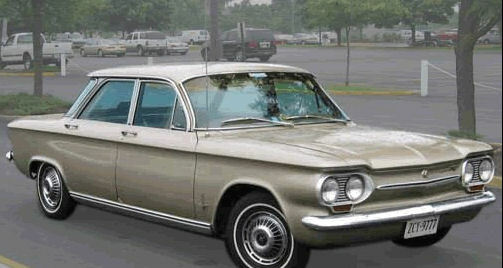 Does anyone remember the Chevrolet Corvair?. It was a radical experiment by General Motors, destroyed by Ralph Nader. He made his name and fame by his book, Unsafe at Any Speed. The car was a "compact," the kind of car grandmothers and maiden aunts would hopefully buy. In fact, it was a pretty hot little car. It had the engine in the rear. This was a flat four cylinder aluminum design - very advanced for the time. The weight in the rear led it to oversteer, meaning that when you went into a turn, it helped you, but you had to work a little to get out of the turn. I found it fun to drive. Oh, one important thing. You had to watch the tire pressures carefully. The ones in the front had to be underinflated to maintain the grip on the road. If the front tires were hard, you might not make it out of the turn There was a design defect in the suspension easily corrected by GM, but too late to save the car and the concept. So it died. But not quite. Corvairs are now classic cars with world wide active clubs, parts suppliers and restoration shops. Sometime about 1965 Merche came home from her office announcing that she was being transferred to Madrid and would take the children with her. So, we planned a goodbye trip to see the grandparents and relatives in Houston and Ft. Worth.. How we got there, I don't remember - plane or train? All of Europe was still suffering from the trauma of WWII and all had severe restrictions on foreign exchange. Spain was trying to develop its indigenous auto industry so there was only a tiny loophole for importing foreign cars. It made sense for her to take a car with her, transportation paid for by the government - and the precious import visa. So, we bought a 1966 Corvair and I drove us to Ft. Worth and to West Texas. We had a wonderful time with Peg and Pro in their first house. Jim just had to drive the tractor, so with Mitch's help he took off. Arthur looked at the horse and opined, "You'd never get me on that thing" But three hours later, here came Arthur on the horse, Billy hit it off with Max and they became instant buddies. And I figured out a way to blow a beer can a hundred feet in the air with a firecracker. A memorable occasion. We all did our thing. Then we drove back to New York and finally I delivered the family - and the car - to the dock in New Jersey. I watched the ship pull away wondering what would happen next. But that is another story. This is about the Corvair. Merche arrived in Bilbao, family and car all intact. She rented an apartment in Madrid in the same block as the Santiago Bernabeau football stadium. She had learned to drive after age 30 and took to it like a duck to water. So, the Corvair did not sit at the curb. In those days Madrid was not choked with traffic as it is today. The SEAT factory was busy turning out the 600 and the 1500 which was all the Spanish could buy - if they had the money. Our air conditioned Corvair was a rare luxury. When I finally joined the family in Madrid, I became the driver for the numerous trips we took. And I didn't follow the Texas dictum, "If it ain't broke, don't fix it." So, I got involved with Corvair maintenance. There was a GM dealership with reasonable mechanics but few spare parts. I bought a timing light, some tools, and did "tune ups". This involved polishing or replacing the distributor contacts. When I needed parts, I had my mother in Ft. Worth buy them at the local Chevvy dealer and send them by first class air mail - the only thing that would get anything through customs. The generator. I decided that the DC generator needed a routine turning of the armature. A simple job in the US. The chief mechanic at the GM place gave me the address where I could get it done. It was a house and the owner had a lathe in the front rook in turning jobs. Quickly and expertly done, but I asked about undercutting the mica. He handed me a hacksaw blade and I was in business for myself. It took a week of sawing away every evening on the thing. We had two memorable adventures with the car. One evening somewhere north of Madrid the fan belt broke. Fortunately I had a spare and a few wrenches. So in the gloom of the setting sun using a fading flashlight I succeeded in installing the new "correa". Arthur was jumping up and down with excitement. "We're having an adventure! We're having an adventure!" After we were on our way, I asked him, "What would have happened if we had to spend the night in the car?" "Another adventure," was the reply. He's grown up now, but I don't think his outlook has changed. A car at the curb is useless, so we took a trip to Granada. Much of the road was enveloped in dense fog and we were driving at night. I glued my eyes on the right hand edge of the narrow winding mountain road. There was a queue of cars behind me honking, but I held my ground and we made it. On the way back in daylight I could see what lay a few feet to the right of the road edge. Steep cliff with a drop off of fifty feet and more. And burned out wreckage of cars that didn't make it. About half way there, a screeching noise developed in the right rear axle. Nothing to do but continue and hope for the best. We drove around Granada, saw the sights and I looked for a garage that could replace the bearing. I managed to locate a bearing somewhere in Spain and get it sent to Granada, but had no confidence in the local garage. The bearing is a press fit on the shaft and, according to the manual, needed special tools. So I took a chance and we drove back to Madrid with the bearing still complaining. Here"s where the fun began. The GM mechanics removed the right transaxle and I saw what was wrong. The bearing was a typical ball bearing but the outer race was inside a donut like thing which was designed to allow for up and down movement of the wheels. The inner real ball bearing was frozen stiff so that all of the rotation was transmitted to the donut. We'd driven four hundred Km with a dry steel to steel bering getting red hot but never fusing together. Our guardian angel was working overtime. Naturally the mechanics didn't have the special push plate needed to remove the bering but they did have a hydraulic press. The Spanish mechanics were used to improvising so they made a frame from two pieces of angle iron held together by two bolts. the attached this to the transaxle shaft and pumped up the pressure. Bang! One of the bolts broke and the two pieces took off in opposite directions. It would have been simple to walk a block and buy new bolts, but no. The called a welder who welded the two pieces of the broken bolt back together. It took another half hour to hand file new threads. This time they soused the bearing and shaft with something like WD40 and this time it worked. The labor bill was quite modest. After I Ieft for England, Merche sold the Corvair at a profit. Wish I knew what happened to it. I hope it was recycled into a Mercedes or Rolls Royce.